A beautiful, landscaped yard will give your home curb appeal. Unfortunately, creating a beautiful yard doesn’t come without its share of expense. Listed below are 15 budget friendly landscaping tips that will help beautify your yard without breaking the bank. Will you take advantage of these tips? Do the Work Yourself. Hiring a landscaping company to landscape and maintain your yard will definitely cost you money. Instead of putting money out for labor, choose to do all the labor yourself. Whether it’s mowing or just planting a few plants, do it yourself! Know your stuff when it comes to plants. Don’t make the mistake of buying plants and trees for your yard that won’t survive. Know what plants will survive in the climate you live in and also how much sunlight they will need during the day. Knowing what plants to put in your yard and how to properly take care of them can save you money. Do Research if you have too. Be sure to research plants in your yard so that you know how to take care of them. Knowledge about landscaping can save you money. Locate a nursery near you to purchase all your plants. If you are going to add flowers or plants to you yard, choose to buy them wholesale. Wholesale nurseries will offer cheaper prices on garden supplies and plants for your yard. Don’t pay the high prices of chain stores. Map out your plan. Before delving into a landscaping project, map out a plan for your yard. What plants will you plant? How much soil or mulch will you need to buy? Mapping out your plan can ensure that you stick to budget when working on a landscaping project. Think outside of the box for mulch. Instead of purchasing mulch at the store, choose to use pine straw that is widely available instead of mulch. Create your own compost to help feed your plants. Learn how to compost your food so that you don’t have to purchase expensive plant food. Composting is good for the environment and also good for your yard. Focus on low maintenance. Low maintenance landscape designs will require that you spend less money in maintaining the area. Catch rain water for watering purposes. Use a bucket to catch rain water to water your plants. This will help you save on your water bill. Never cut the lawn too short. Cutting your lawn too short will encourage weeds to grow. Getting rid of weeds can get expensive. Decorate with natural products. Use natural décor for your garden and landscaping needs. Refuse to put it in your garden unless it is earthy friendly and inexpensive. Invest in the right tools to help maintain your yard. The right tools will help you get the job done quicker. Instead of spending money on a yard guy to complete your yard work, use the money to invest in your own tools and do it yourself. Don’t spend too much money on garden accessories. Don’t go overboard with garden accessories. Too many accessories will give your yard a cluttered look and could also be very expensive. Save your money and allow the beautiful flowers and green grass to be the accessories. Make your own garden accessories. If you do choose to add in garden accessories, choose to make your own. This will be very helpful to your budget and will also be fun. 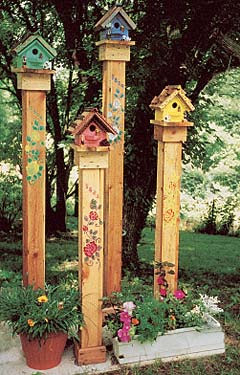 Make a bird house or create your very own stepping stones to add to the beauty or your yard. Outdoor furniture should be weather resistant. To help your budget, choose outdoor furniture that is weather resistant. Weather resistant furniture, will ensure that you aren’t making another costly purchase on furniture in the near future as it will last much longer than furniture that is not made to stand up to the elements of the weather. The 15 budget friendly landscaping tips above will help you get the beautiful yard that you want without spending all of your hard earned money. Take advantage of these tips to help get the yard that you have always desired. This article is contributed by Sarah from 1001 Sundials, an online store to buy decorative garden sundials and pedestal bases. These are very helpful tips about budget-friendly landscaping. Landscaping your area will surely give your house a compelling look. I installed a synthetic grass to make the landscape of my house look good and incredulous.